This is Zorz, the new resin from Tesselate HQ for 2015. Zorz is the first in a series of complimentary friends known as the PEXT Friends. 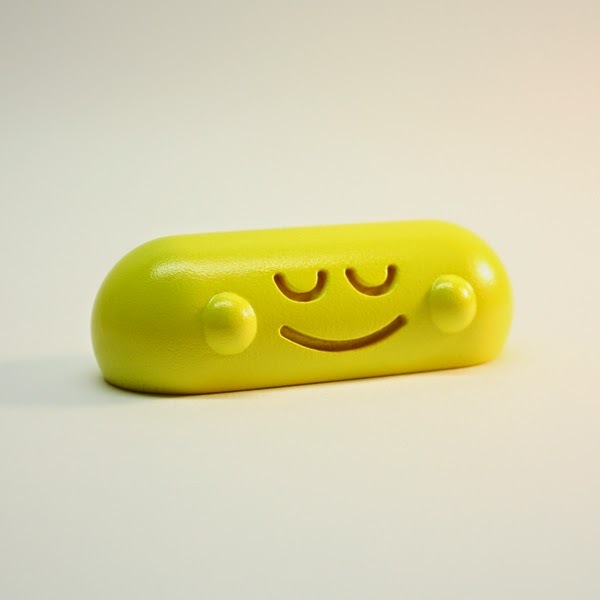 This ‘Future Yellow Edition’ is a small run of 10, and each character will be signed and numbered (on the bottom) by Tesselate. Zorz is available on the Tesselate shop at 8 for £10 + p&p. 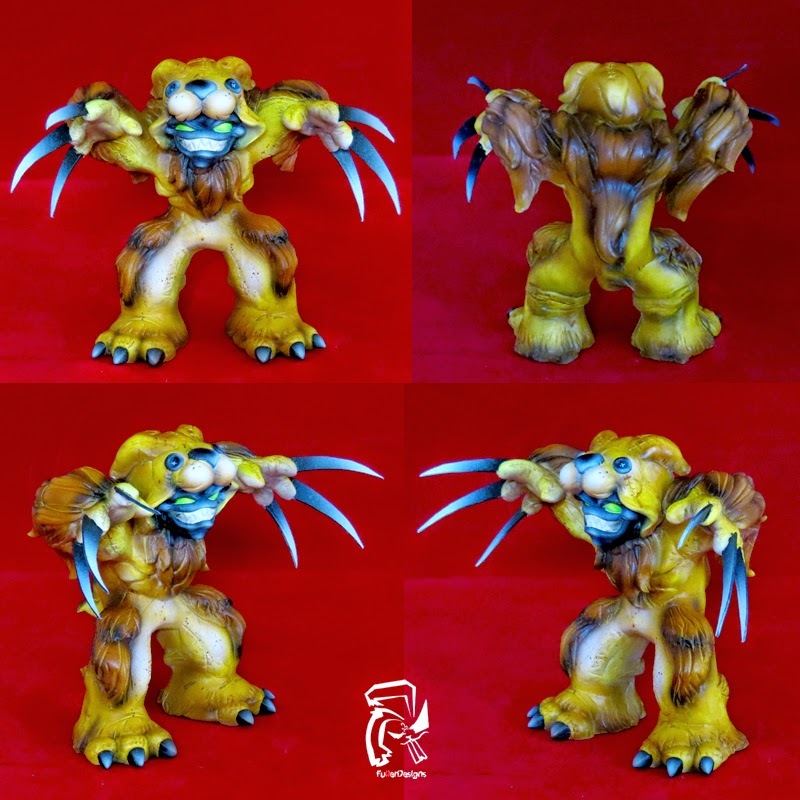 Zorz is 9cm/3.5 inches wide and 2.8cm/ just over 1 inch high and is cast in polyurethane resin and finished with multiple coats of clear lacquer. Inside of the packaging header card will be a special unique message to each Zorz owner. This secret is between you and Zorz itself. Zorz is always watching, listening and judging. Just please be careful not to stand on his balls. 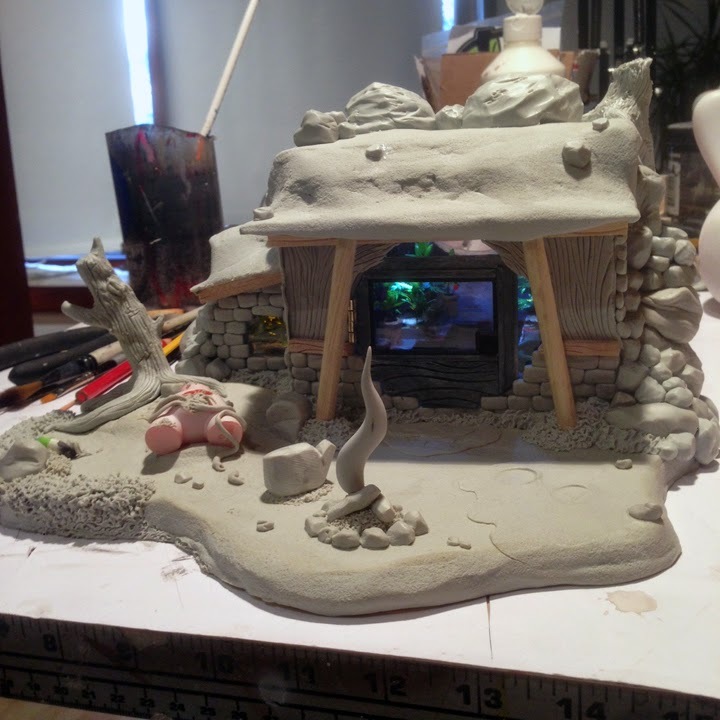 Cass Jerman @cassjerman 's been busy (but, she's never too busy for you, sugar) in the Chudfundary desert collective sculpting, casting and painting little 1-of friends. 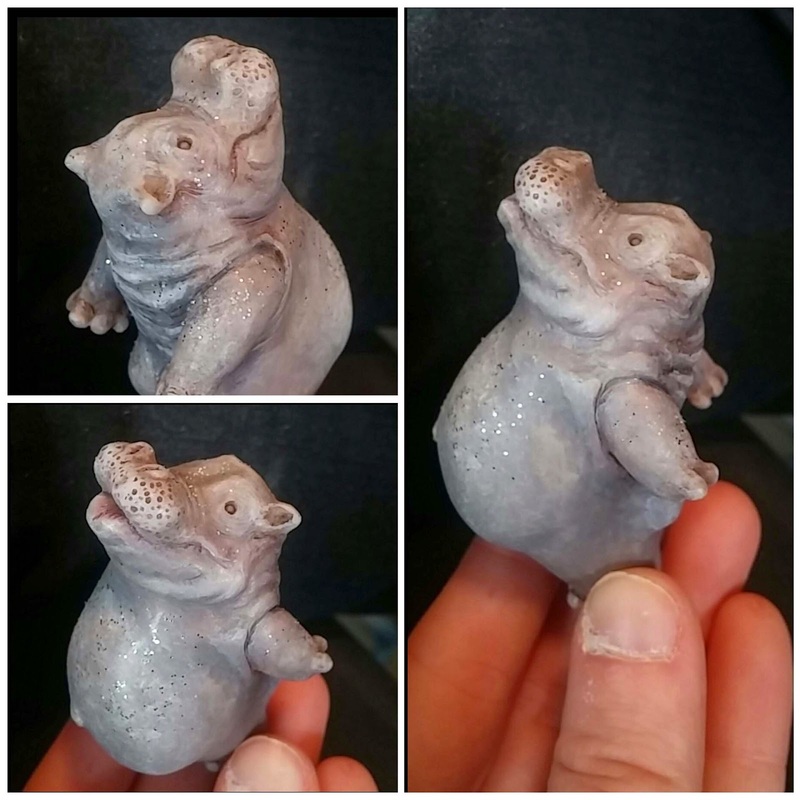 An assortment of 15 hand painted critter sculpts which debuted at DesignerCon 2014 are available on Cass' eStore here ranging from 35-40$ea. 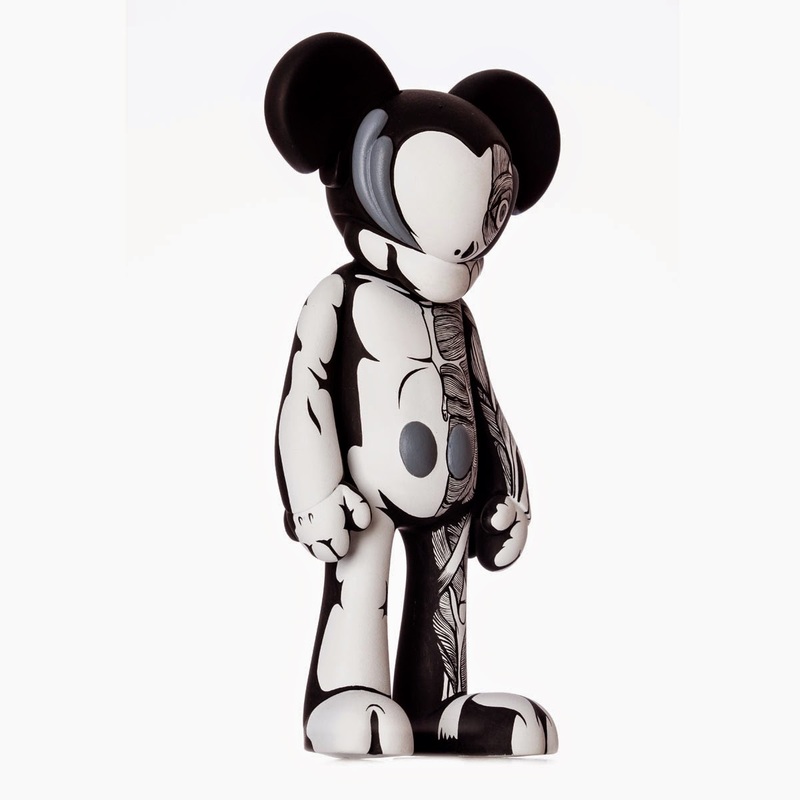 These are 1-of paint jobs, and will not be reproduced. Periodically Cass will post a new one-of-a-kind colorway to her instagram @cassjerman and put it up on her eStore, so follow along to stay up-to-date with the new releases. Once all these casts find homes, the molds will be retired, and a new different project will replace them, so collect your favourites! 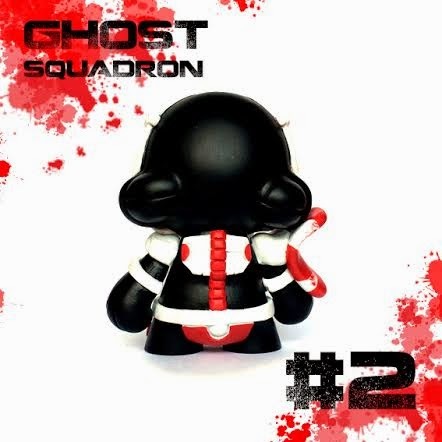 Shadoe Delgado is holding a last call for orders of his resin cast original sculpts from his Shadows & Ghosts series. The molds are being retired, they will be gone! No more! 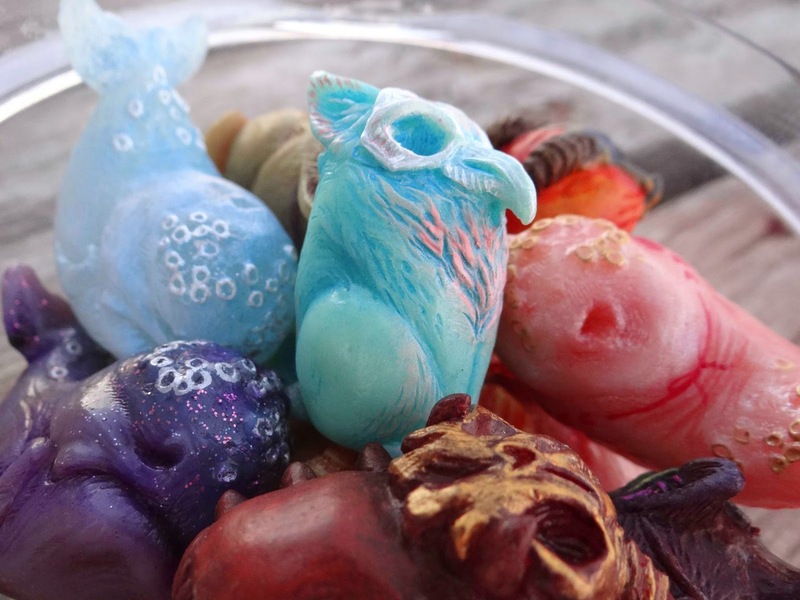 Some clear-cast resin Shadows and Ghosts in an assortment of colours are available here for only $20ea. 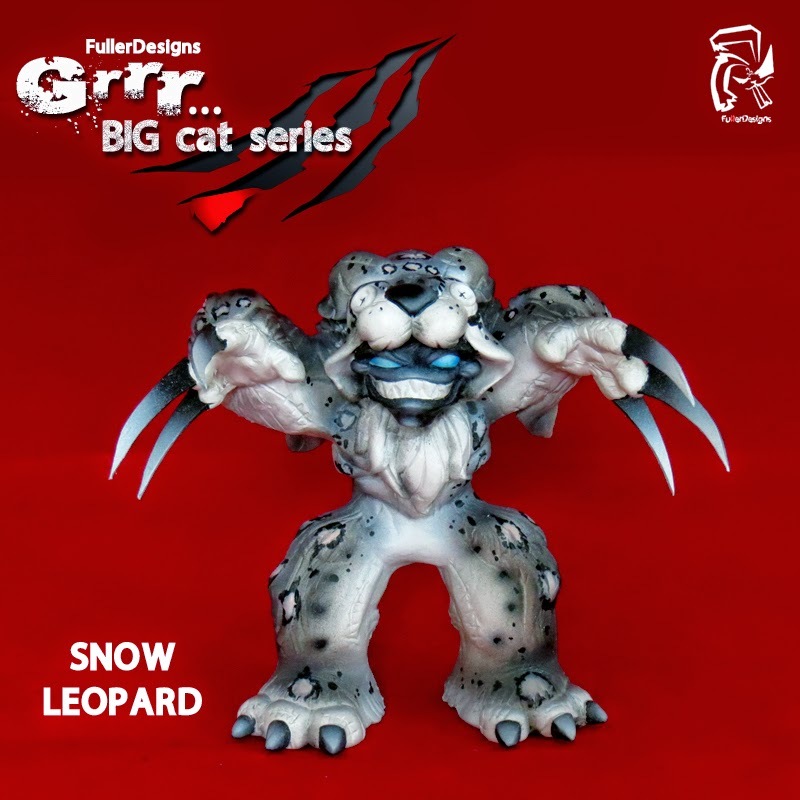 Be sure not to miss out on these original sculpt characters. Once they're gone, and so are the molds, they can't be recreated! Follow Shadoe online on Instagram @shadoedelgado and Facebook for updates. And for special goodies nobody else can get, subscribe to his Patreon. 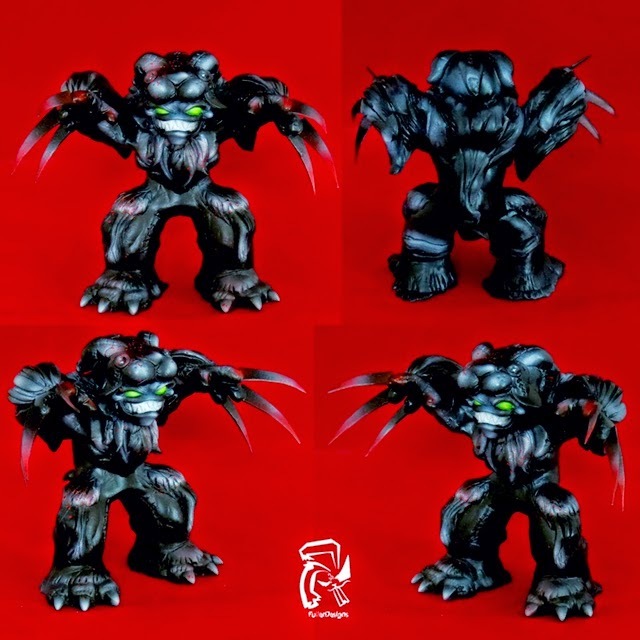 Goodleg Toys is continuing the line of War on Prehis figures with some one-off Zombie Battle Drones by Small Angry Monster. 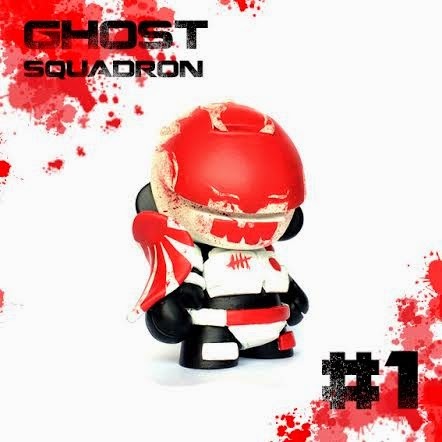 Available for $75 each, the figures come bagged with a header card and include a War on Prehis mini-comic. 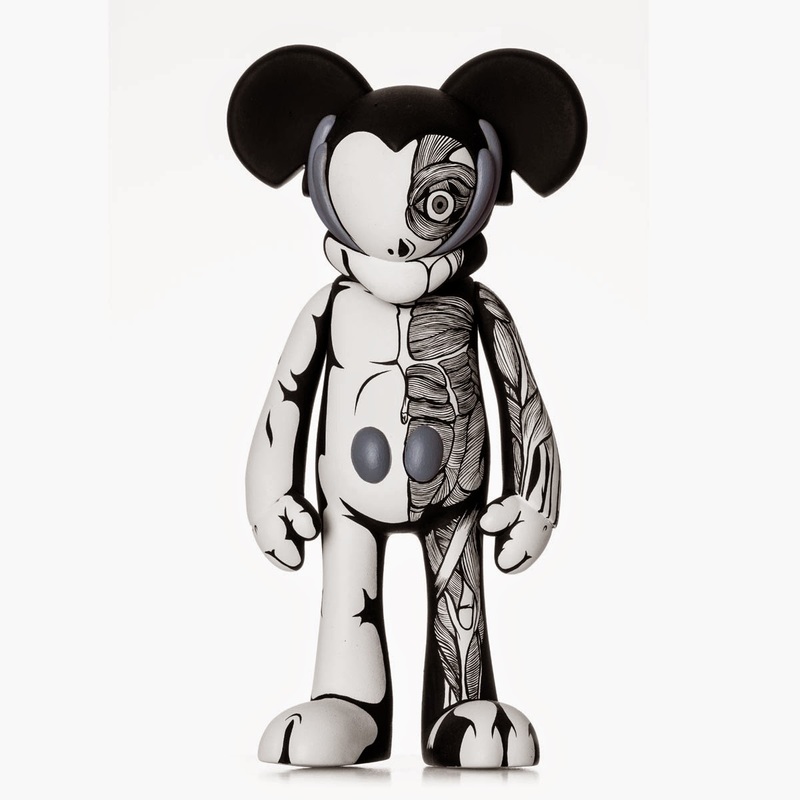 Be sure to checkout these and all the other figures Goodleg toys has for sale. WIP photos are always great. A brief look into an artists method and unfinished work. 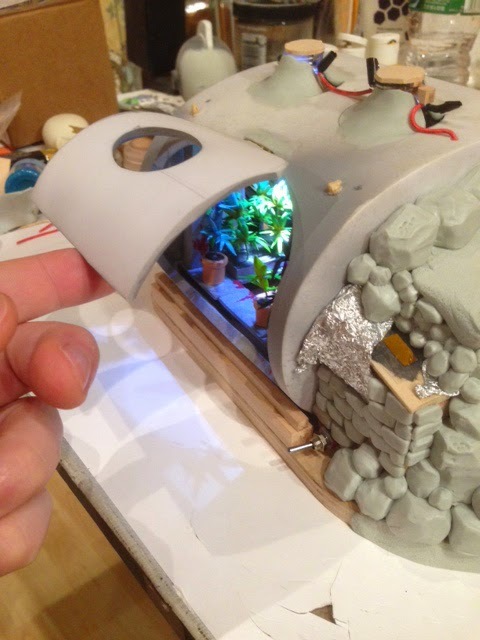 Nugglife's latest WIP photo's of Zombie Nughut shows rough sculpting, some foil, a switch and wires exposed. All of which will likely become hidden and seamless in the completed piece, as with all of Nugglife's pieces. 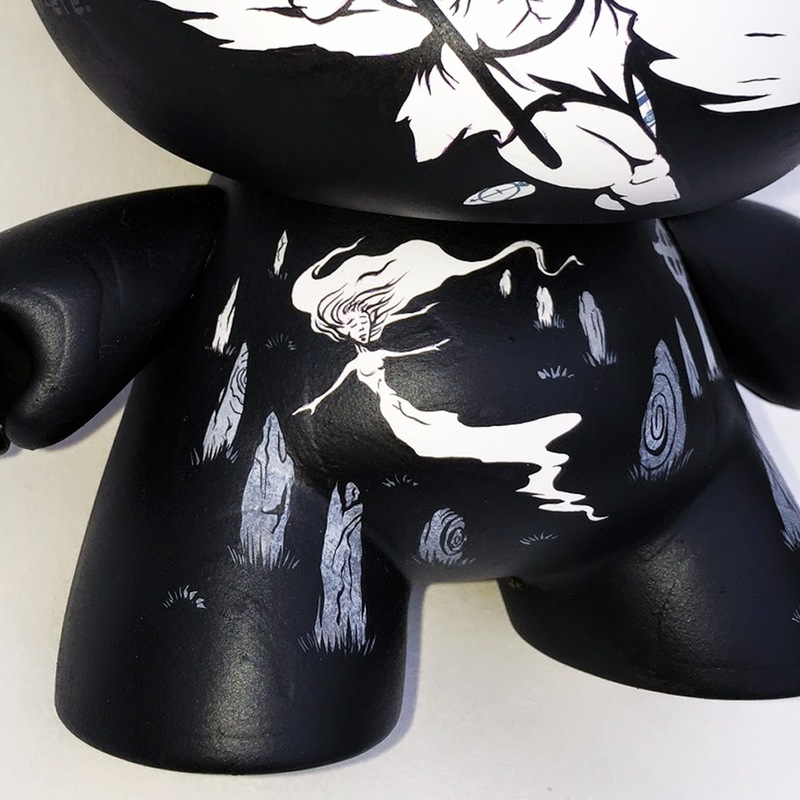 Being built on a MADL head, a full reveal of this piece will be coming in the next week or so. Great insight. 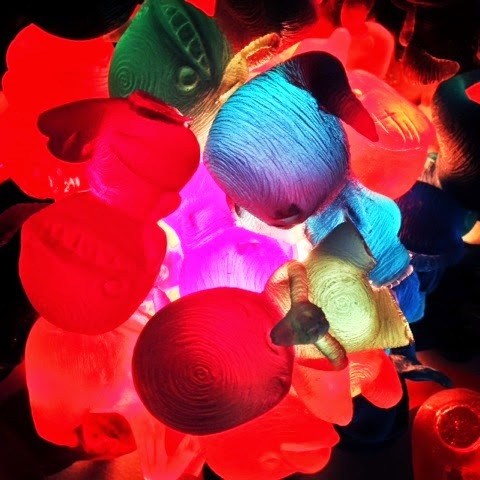 James Fuller, of Fuller Designs, has been busy lately creating new figures. 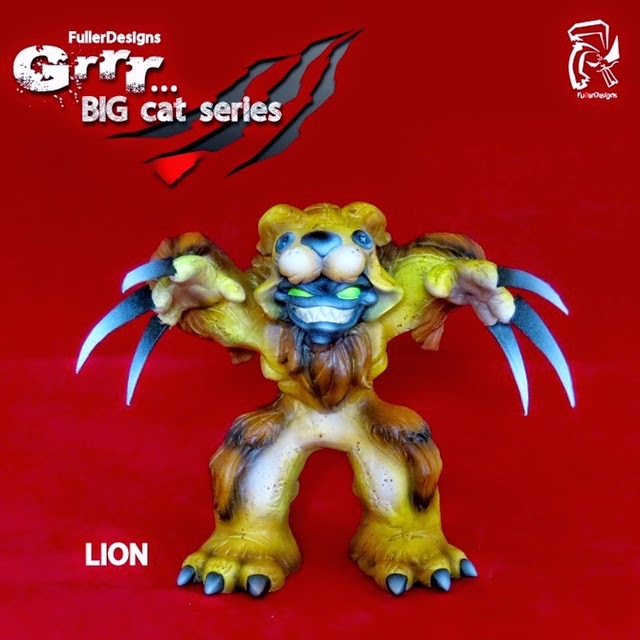 Wanting to go bigger, Fuller created a 6" figure based on his Grrr character. 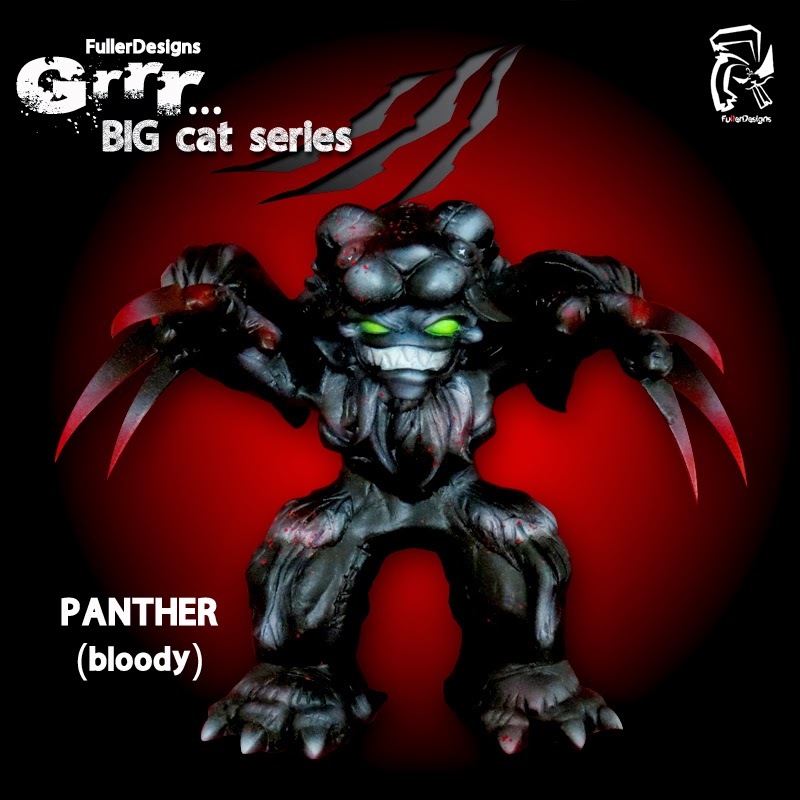 Sculpted to be a little rough around the edges and all grown up, Series 1 of Grrr Big Cat Series features 4 different designs: Classic Tiger, Snow Leopard, Lion and Panther(Bloody). Priced at $140 each plus shipping, each figure was molded and cast by Fuller himself. Painted using Createx airbrush paints and acrylics, these are definitely a labor of love by Fuller. 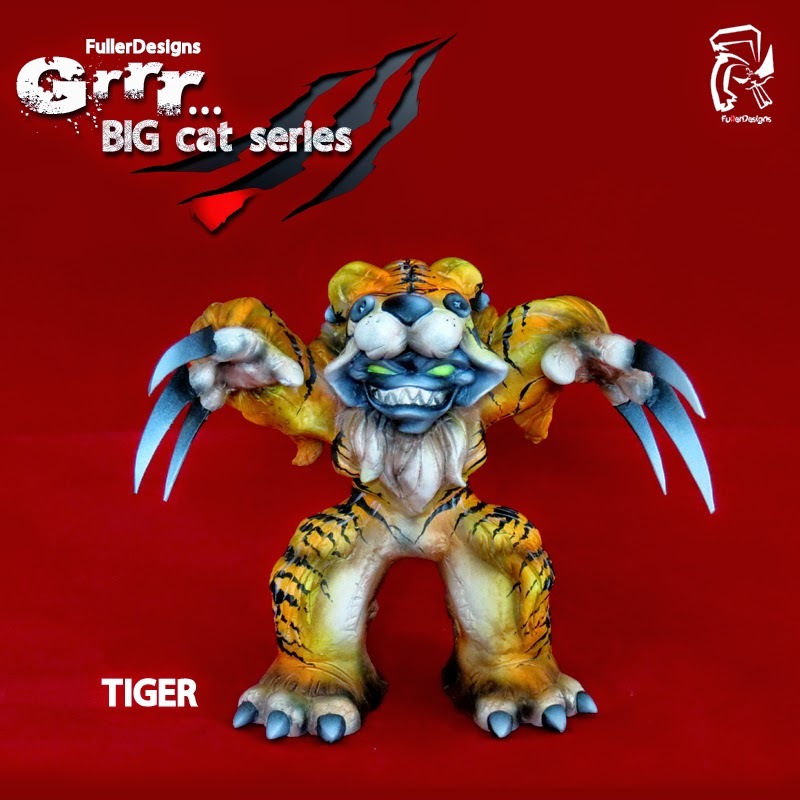 If these sell well, Fuller might be able to produce a Series 2 later this year. 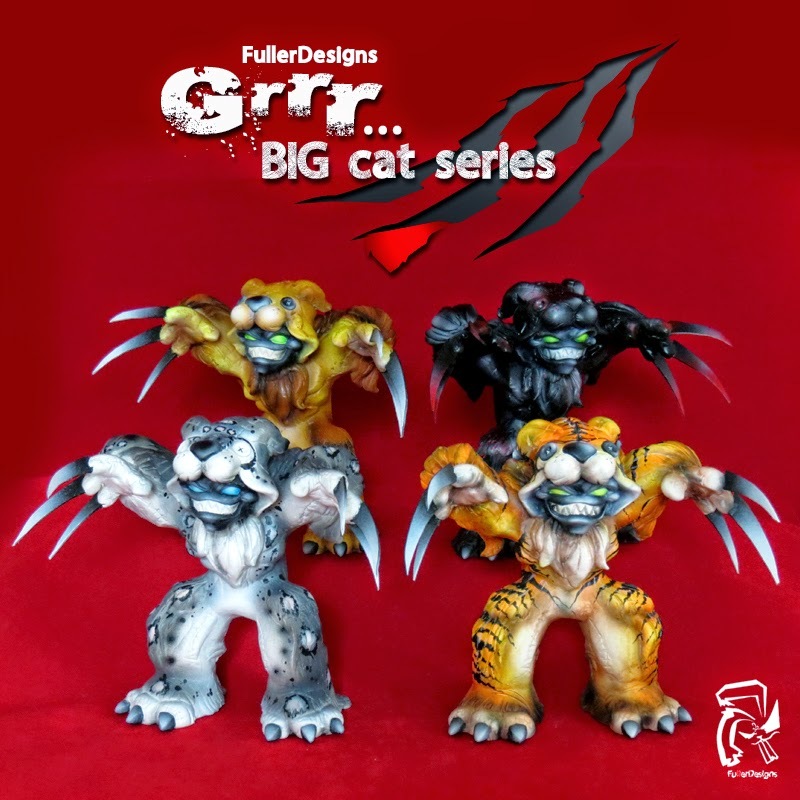 Due to the amount of work involved in creating these beasts, Fuller had to make the decision to limit the number of designs per series to just 4. Be sure to check them out and pick one up, these are great. 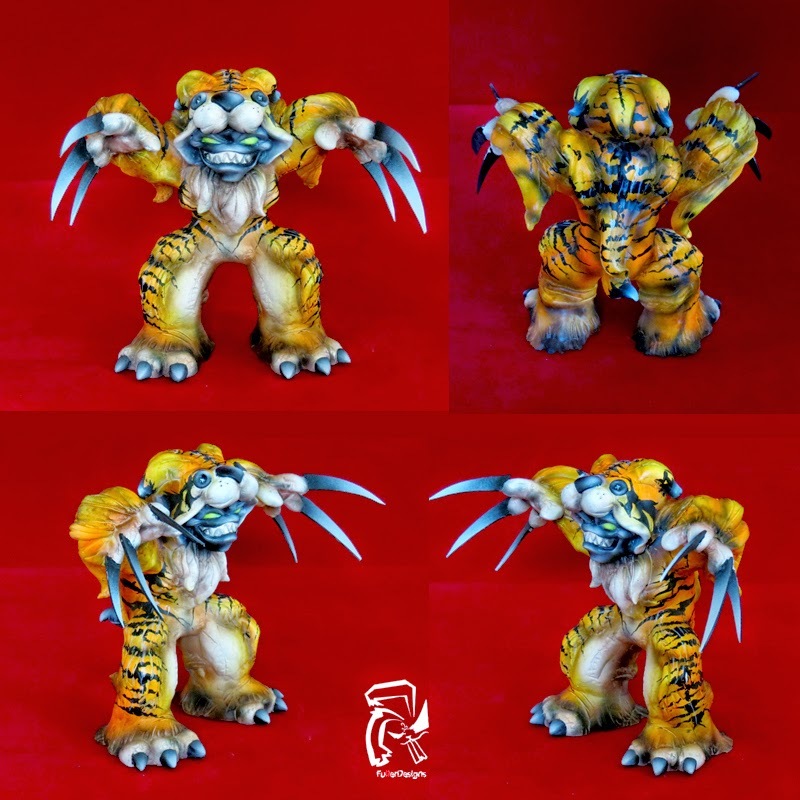 As of right now, the Classic Tiger edition is sold out but there are a number of each of the remaining 3 designs. 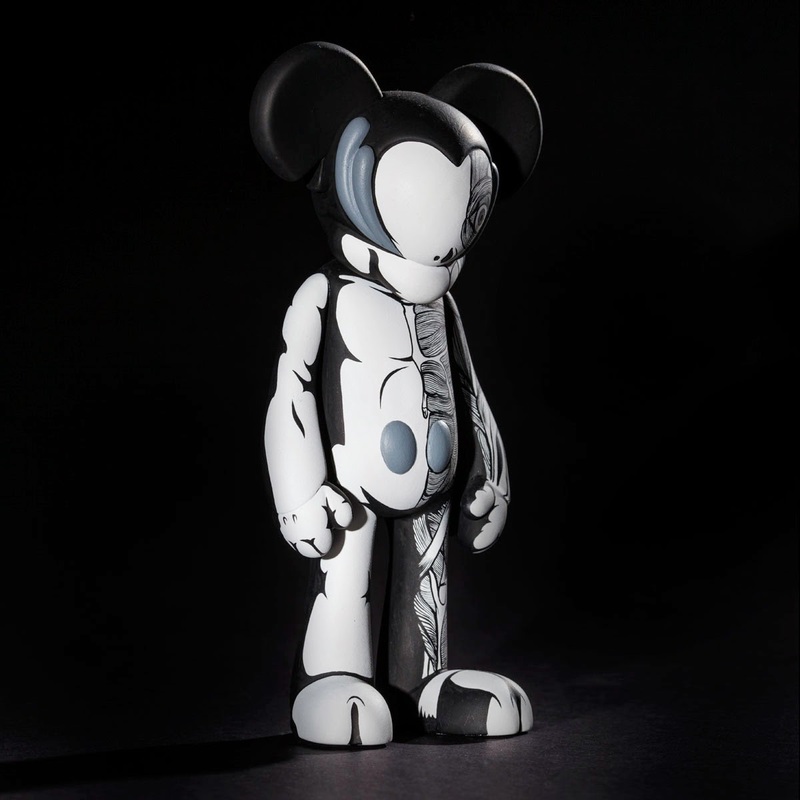 Nugglife not only creates awesome figures, but canvas work is also part of the repertoire. 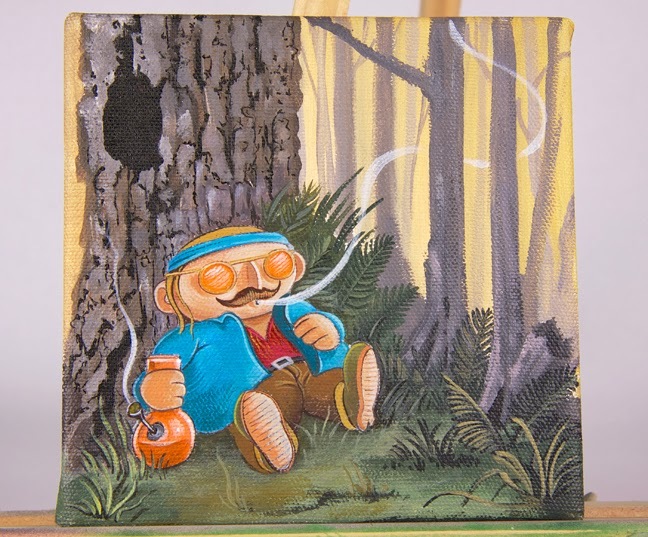 A 6"x6" collaboration piece titled "Lost", Nugglife worked with Eric Ziobrowski to create Smokey relaxing in a nice scenic spot. 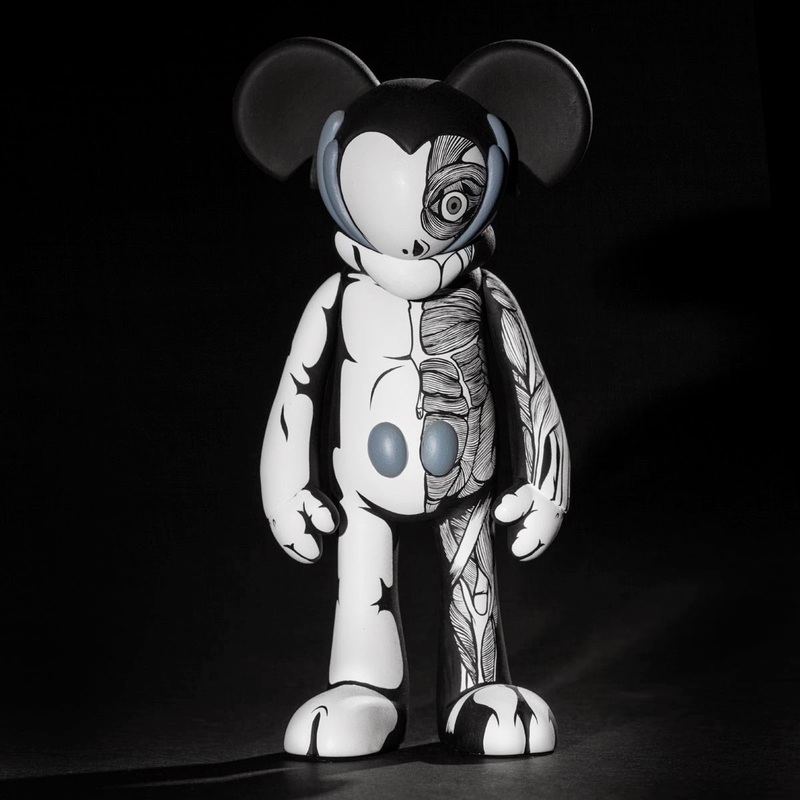 It's always nice to see 2D work from toy customizers. 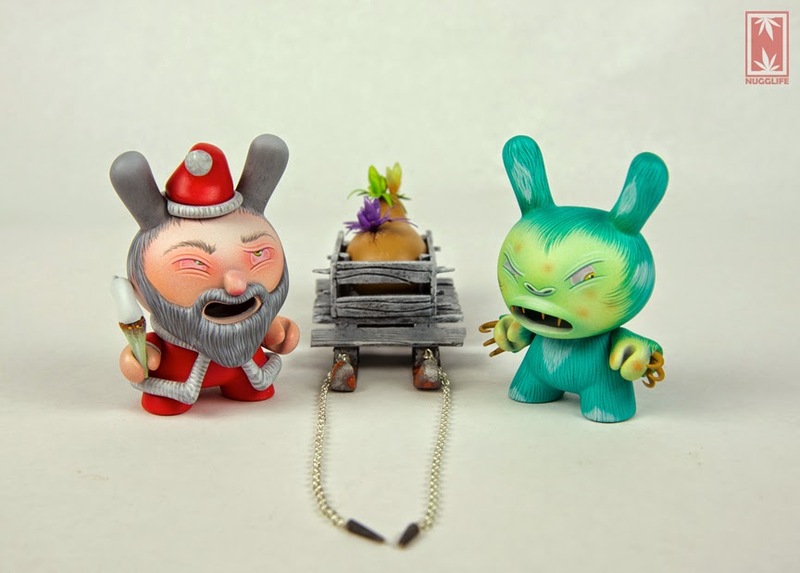 One of Nugglife's latest creations is the Hopeless XMas custom Dunny set. 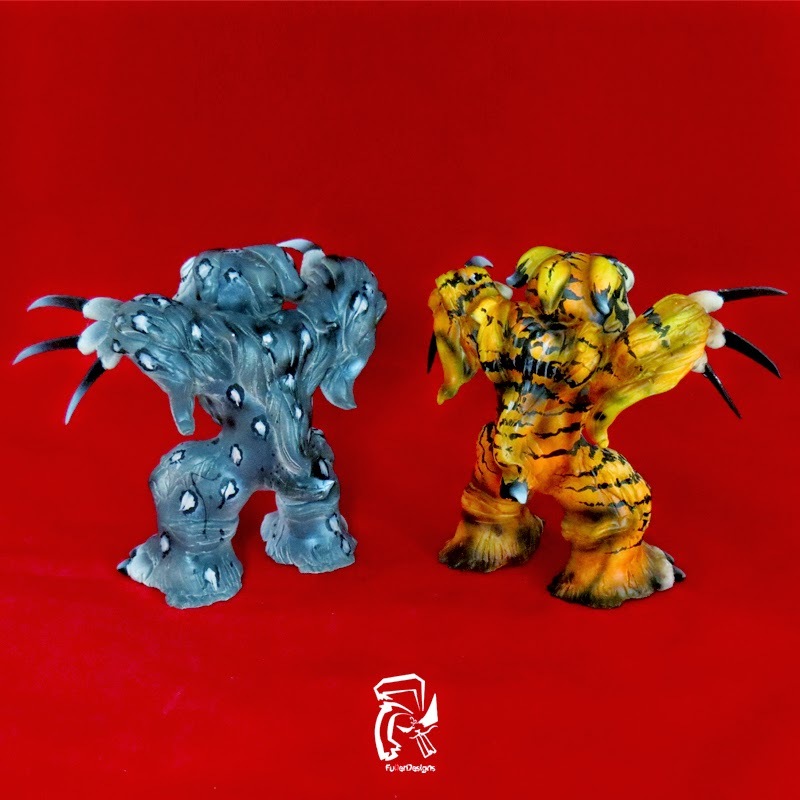 Including two of Nugglife's favorite character's Smokin Clause and Nuggyeater, these pieces were hand sculpted and painted. Smokin Clause was spotted by Nuggs, lost in his travels due to a big snowstorm. Now Smokin Clause needs help to find his way, before Nuggyeater finds him. This set is already sold. Jon-Paul Kaiser gets requests to customize everything. 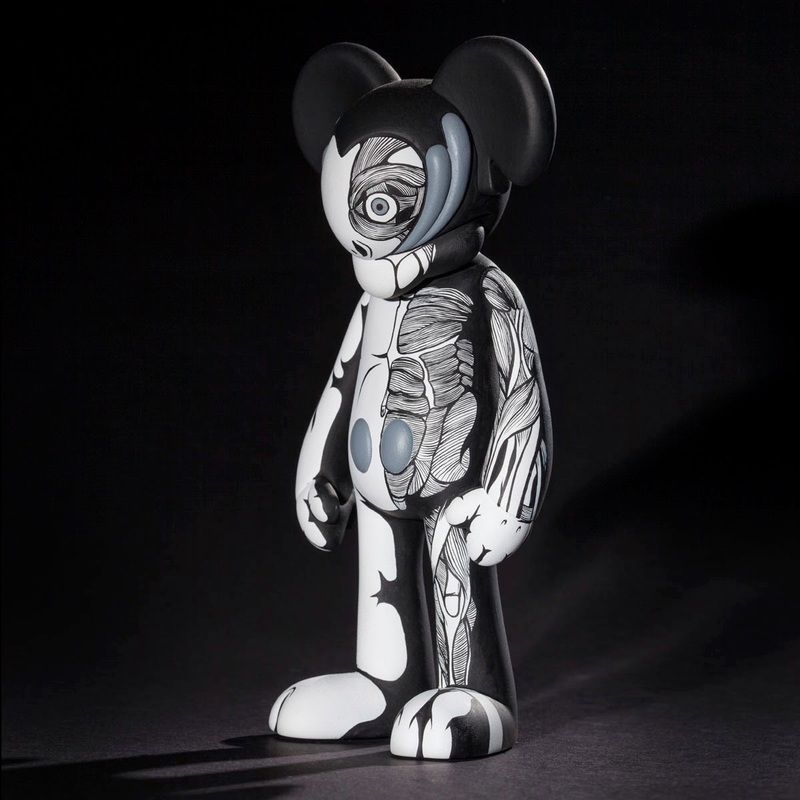 Jon-Paul's latest custom is based off a MICKIV figure by Arkiv. 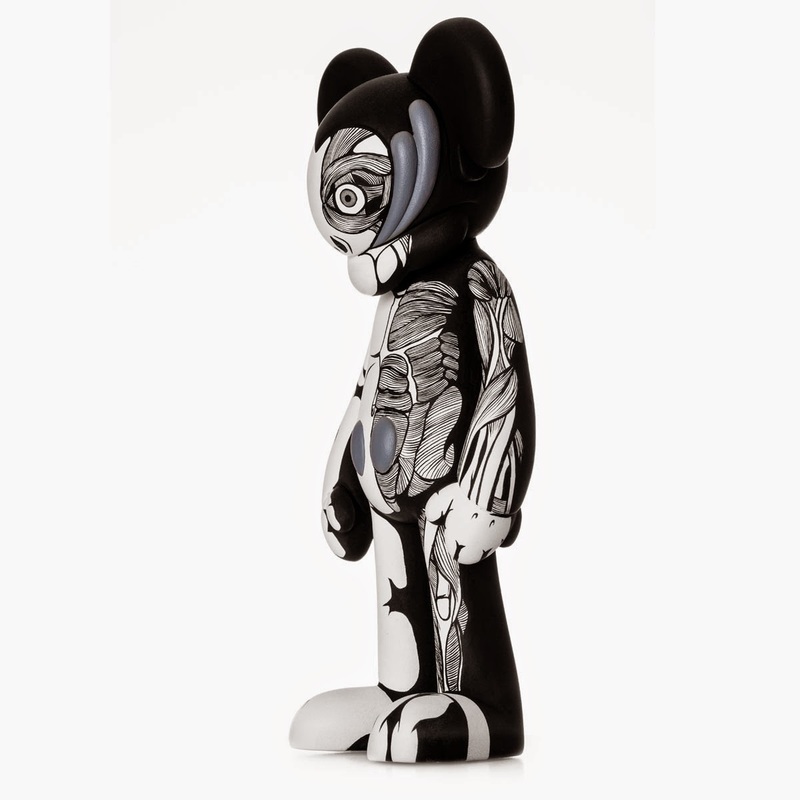 Taking a half minimalist approach to this stunning figure, Jon-Paul created the splayed musculature innards of the figure on one-half, while creating the skinned version on the other. A very clean custom which was photographed by Justin Allfree, Jon-Paul's photographer for all customs and work. 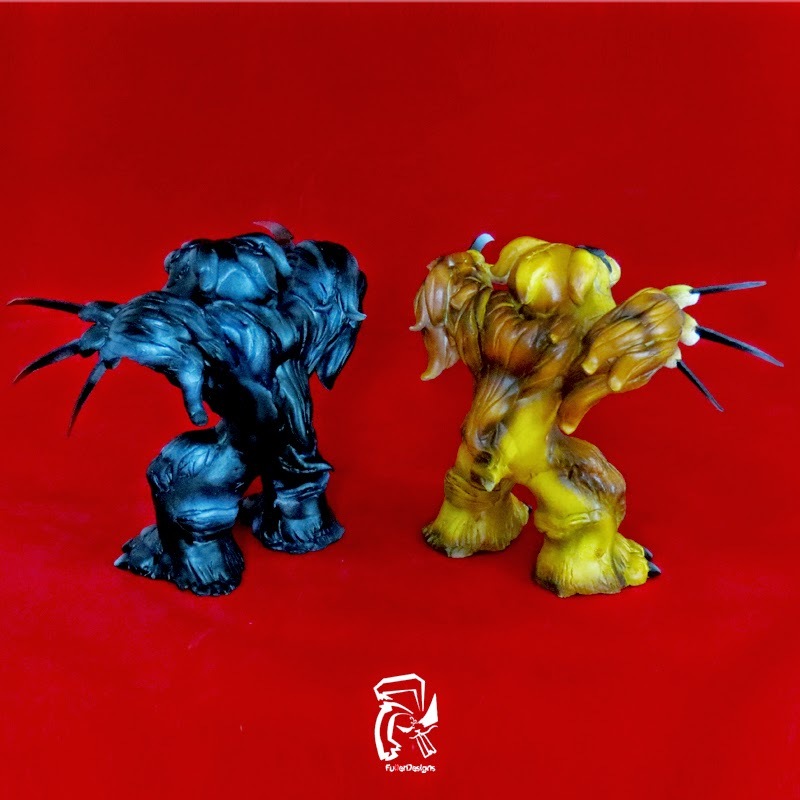 With Valentine's Day just around the corner, Devil's Head Productions will be spreading the love with unpainted Alavaka figures, sold in blind bag fashion. 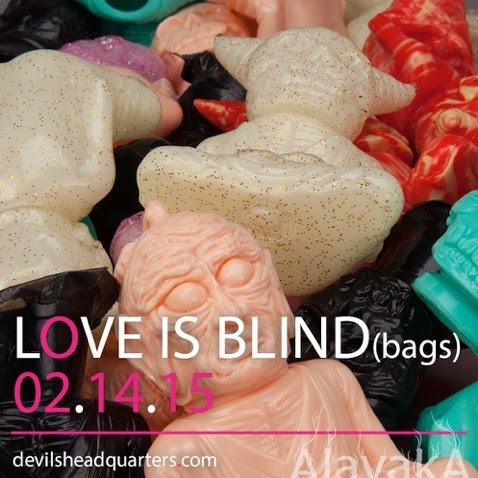 Each blind bag will contain an unpainted Alavaka, with the Bodhisattva head making an appearance in a few bags. 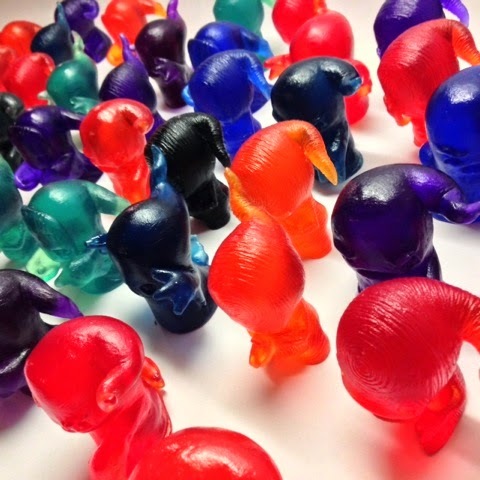 With 7 different colors available, purchasing more than 1 blind bag will have a no duplicate color guarantee by DHP. Each bag will sell for $50 plus shipping on Valentine's Day, February 14th, through the DHP webstore. 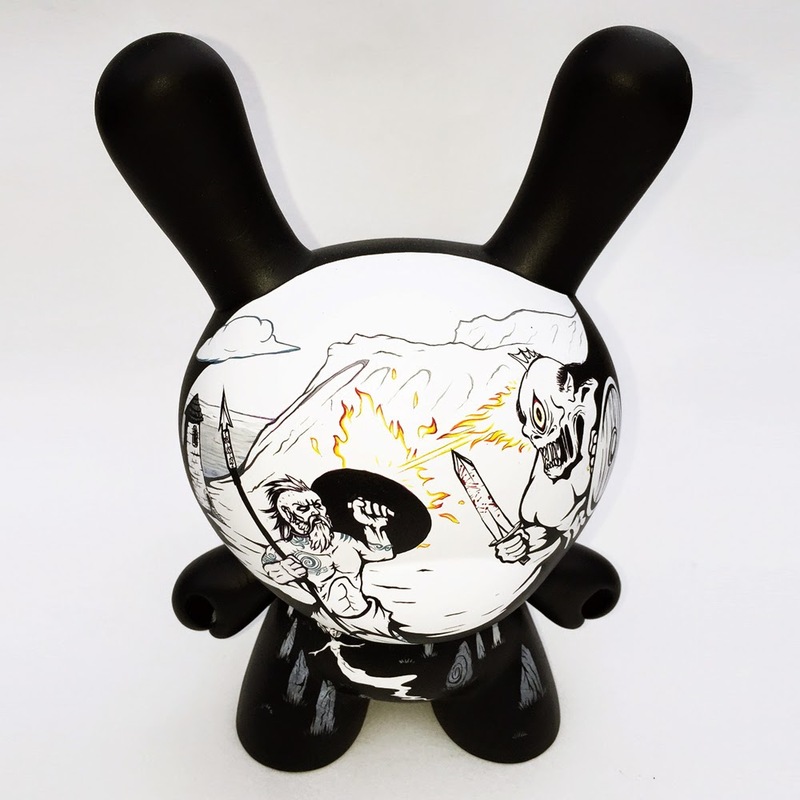 Kidrobot's Dunny figure not only makes for creating(or recreating) some cool characters, the figure can also make a nice canvas. 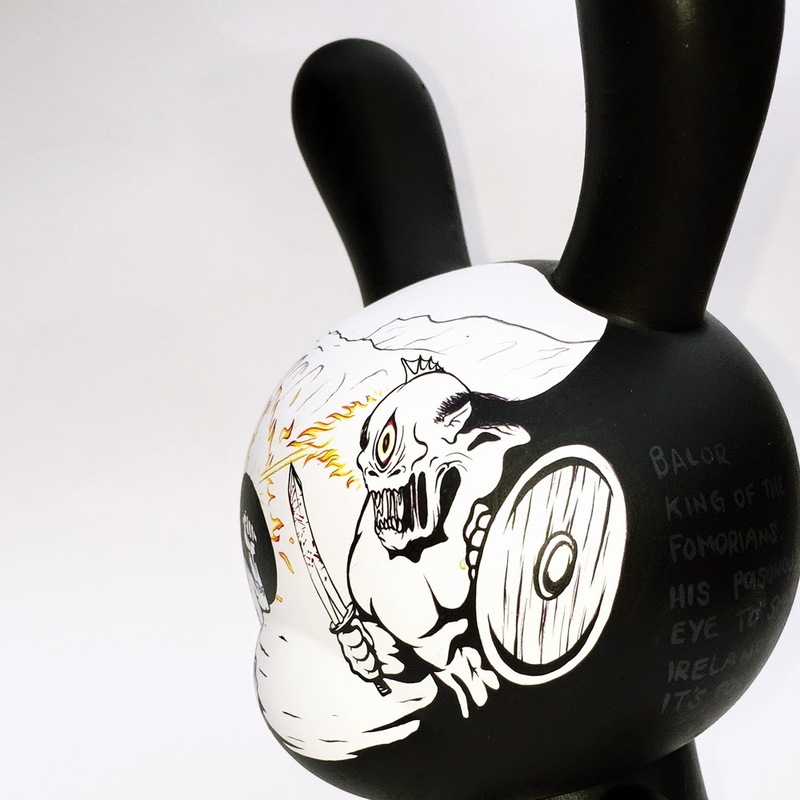 Jon-Paul Kaiser's latest custom 8" Dunny features an Irish/Celtic mythological theme. 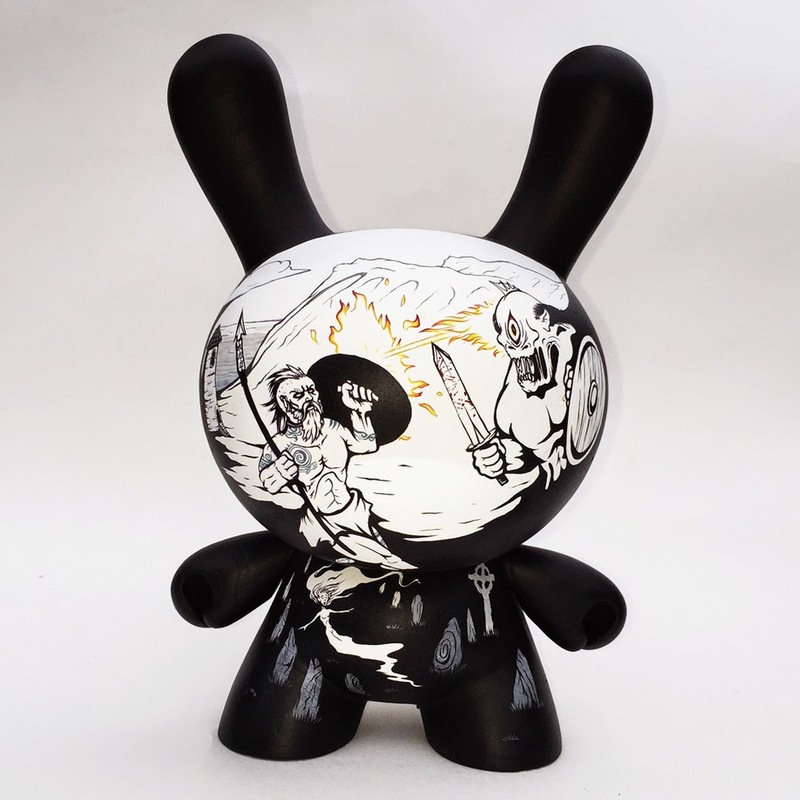 One of the most popular legends is Lugh the High King and Protector of Ireland and Jon-Paul portrays this legend on the Dunny as Lugh battles with Balor the Dread Eye, King of the Formorians. 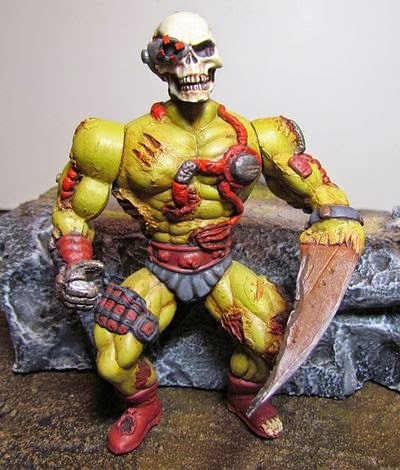 Legend has is that Balor is said to be able to open his eye and have his dread gaze burn whatever is his gaze. To go along with the two adversaries is Oonah Sidhe, Queen of the Fairies, portrayed on the body of the Dunny. Oonah Sidhe is Summoning the power of the Earth goddess through the ancient standing stones to assist Lugh in battle. This is another great piece from Jon-Paul, with the photos taken by photographer Justin Allfree. 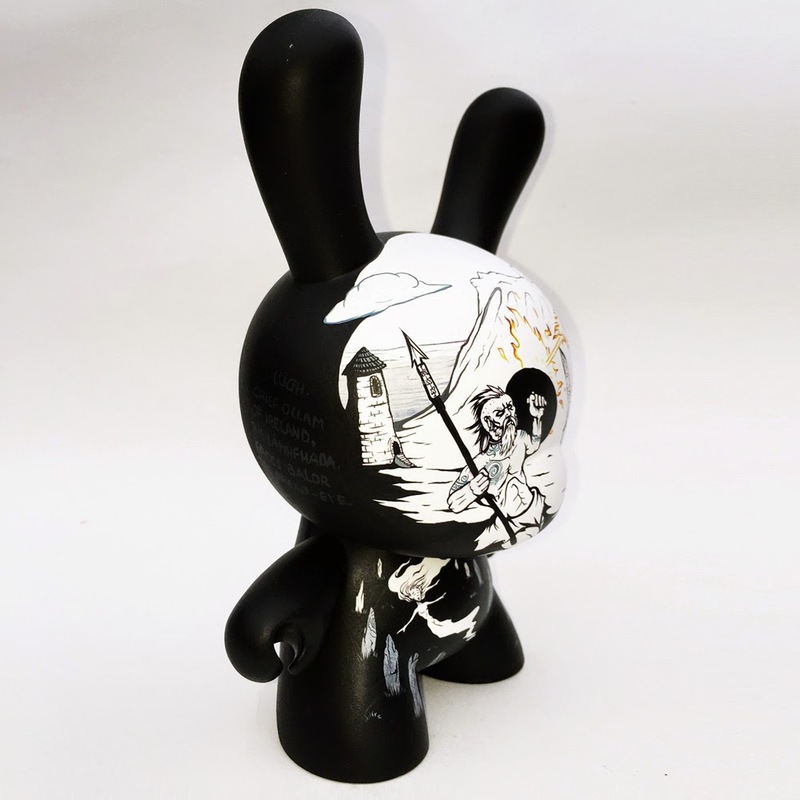 Darren Clegg shares with us two new 4" Munny, sculpted and hand painted, coming to Collect & Display 13.02.2015. 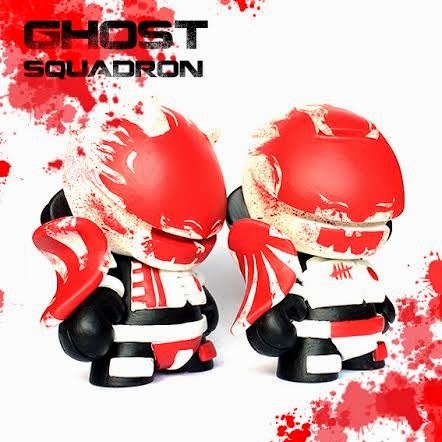 Titled Ghost Squadron #1 and #2, these pieces take influence from the Japanese flag and emblem, giving them a warrior-like appearance. I particularly like the detail of the sun on the shoulder plate, inverted from #1 to #2, appearing to be the Rising Sun and Setting Sun. These pieces will be available individually for £60ea on 13.02.2015 here on Collect & Display. For more of Darren's work, you can follow @darrenclegg on Instagram. 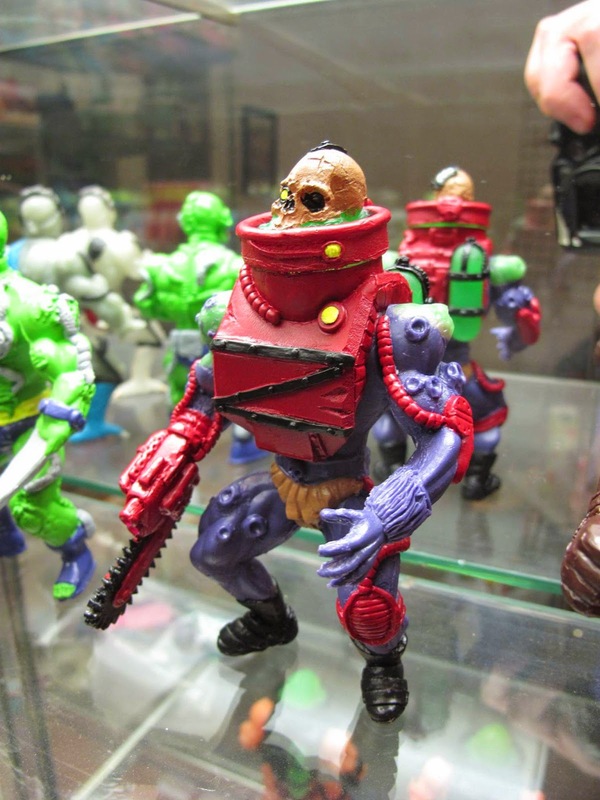 Having reached and surpassed their funding goal last week, Bigshot Toyworks has been busy creating fun new Stretch Goals for their backers. The first Stretch Goal awarded free stickers and button packs to certain backers. 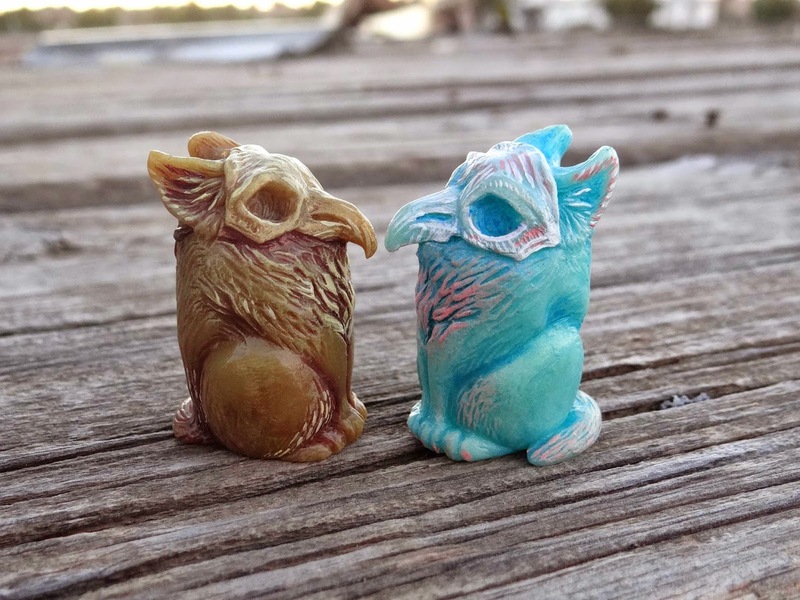 The second Stretch Goal, which has just been unlocked, is the two pictured Kickstarter Exclusive variant figures of Ghost and Raven, with new head shapes, and a special, super-limited Kickstarter Exclusive color variation. 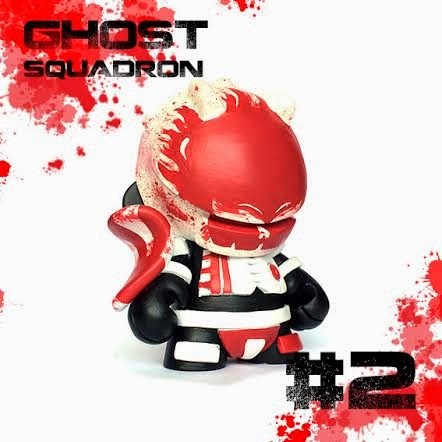 These KS Exclusive Ghost and Raven figures will only be available as optional Add-Ons to backers of the Four Horsies Kickstarter who have opted for a set (or sets) of the Four Horsies figures, or the Maddie Bust reward. Each figure is offered as an Add-On at a reduced price of $20 per figure. Bigshot will only be producing enough in this colorway to satisfy the Add-Ons pledged by the KS backers. The Four Horsies Kickstarter ends on February 18th so get your pledges in soon!